You realize you're committing a sin don't you? Just what wish did you desire so badly? Outside, the sun had only just begun to slowly set below the horizon. The golden colored sky would slowly begin to fade and dim as night replaced day. However there existed one location where the light would never fade. Within the vast underground networks of Inferno, there existed a secret facility, hidden away from the watchful eyes of Eden's government. Outside the reach of Eden's laws where they can research Eden's greatest taboo in safety. The temptation of a wish. It was enough to make some folks throw caution to the wayside. Such people inevitably do not remain long for the world. No, instead the people here would take their time, and slowly uncover all the mysteries of this phenomena, peel away all of its secrets. And then, once it was completely safe and controllable, they would reap benefits beyond their wildest imaginations. The folly of man. There are some things that are forbidden for a reason. Some powers that can be neither tamed nor broken. And those that deal in fire should not be surprised if they get burned. For the first time in as long as anybody could remember, the constant white lights that illuminated the facility briefly flickered. They flickered again. They began rapidly flipping back and forth until with a low whine, they remained off, plunging the facility into darkness. There was a click as the electronic locks were disabled. At the end of a corridor, a door opens and a boy slowly makes his way out. In the distance at the other end of the corridor, he could hear screaming. And in the air he could smell... blood. Normal instincts told him to flee in the opposite direction, away from the danger. But in the distance, there was a brightness. He walked towards the light. As he walked, the smell of blood became thicker and thicker. The screams had long since died away. But the boy was determined. Once he decided upon a course of action he would see things through. He found himself at the corridor's end, standing in front of a door. Without hesitation he opened the door and found himself in a large white room that had been stained red with the blood of the numerous corpses within in. And in the center, staring at the boy was a giant nightmarish hound cloaked in brilliant red flames. It opened its mouth and spoke in a deep growl. "And who exactly, are you?" Her eyes narrowed. An image had flashed through her mind. An old parchment that she had once stolen and sold on the black market for a hefty price... she still remembered its contents. Yes. She did have one option left to her. Even if there was nothing within this jail cell, she possessed the knowledge she had accumulated over years on the streets of Inferno. It was... a risky gamble. She knew that. It was something that could easily leave her in a much worse situation than her current one. It was the greatest blasphemy that she could possibly commit within the city of Eden. But she had no other options. If damnation was the risk, then so be it. She forcefully bit her own palm, hard enough to draw blood, and then slowly began to draw a summoning circle on the floor of her cell. There was nothing else she could use to paint the circle. The process took over an hour, but in that time nobody came to check on her. Who would? She was a bird trapped in a birdcage. Absolutely no risk or danger whatsoever. There was a burst of black smoke that exploded out from the circle. The smell of burning metal filled the girl's nostrils. And at the center of the circle... stood a tall dark skinned lady devil with eyes like burning rubies. She stared at the shocked girl without any apparent interest, with her arms crossed. Across the empty back alleys of Inferno, a solitary shadow flickered through. Several heartbeats later, three more shadows flickered after it in pursuit. Theola raced through the twisting streets and paths at breakneck speeds, moving with the nimbleness and grace that had been drilled into her body as a result of years of specialized and brutal training. There was absolutely no way an ordinary human being could keep up with her. Unfortunately, her pursuers were anything but ordinary. They were the 'same' as her. Underworld assassins. They had undergone the same training, possessed the same capabilities she did, the same skills she did... only the outnumbered her three to one. In other words, there was no way she could outfight them. And as her current situation demonstrated, there did not seem to be any way she could escape them. But still, she had finally found it. The thing she had been looking for, a way to finally escape this life she hated, a chance to start over as someone new. Someone different. To that end, when the chance came she betrayed her organization in the midst of a transaction and stole the prize for herself. Something priceless. The hope of a miracle. She refused. She would escape this situation. She would achieve her miracle. She did not care what the price was. Putting her head down, she pulled out a burst of speed from deep within herself and dashed forward. And then just as suddenly, she cut sharply to the side, moving into a side alley. Taking a few more steps, she took a deep breath, kicked hard at the ground, and leaped. She then kicked off a wall, another wall, and landed on someone's balcony without a sound. She immediately threw herself to the floor and held her breath, listening until the pursuing footsteps went past her into the distance. She had brought herself some time. As silently as she could, she broke into the apartment of the balcony where she had landed. Fortunately for her, it seemed to be empty. She quickly took out the parchment and a bottle of red liquid and begun to draw the diagram that was pictured on the paper. The moment it was completed, a foul smell began to leak from the center of the circle, stinging her nose. A mass of flesh seemed to leak out of the various vigils drawn, combining and transforming into a single mass until a giant leering flesh monstrosity covered in scars was staring straight at her. It growled. The news had caused something to snap inside of himself. His parents had died a long time ago. And now his brother too, was dead. His family was gone. It wasn't fair. This wasn't fair. Still in a shocked stupor, Asher walked around his abode in a daze. And without thinking anything in particular, he began violently destroying his own home. He pauses. In his rampage, he has found a safe that he has never seen before. Along with a letter. Gingerly, he picked it up and began to read. A letter from his deceased brother. An inheritance for Asher in case anything had ever happened to him. What was inside was a miracle that would grant Asher the power to protect himself, to live his life and achieve his dreams. It was a power too great for himself to control and tame, but if it was Asher, he knows he'll be able to do it. He was always the best of them. Slowly, Asher turned his attention to the safe itself. There was no combination or code written in the letter, but he knew in his heart what the password would be. Using his birthday, he unlocked the safe and discovered the terrible secret his brother had hidden inside. "...just what were you doing, brother?" Asher whispered to himself as he read the notes hidden in the safe. The ability to gain a wish at a price. The ultimate taboo set by Eden. Asher's eyes narrowed. Ultimate taboo? Who cares what Eden thinks. Who cares what they consider taboo. They couldn't keep his family safe. They were no better than garbage. If it's a taboo, then he'll show them just what a blasphemy is. He drew the circle and performed the ritual. Immediately he was thrown back by a blast of air. A terrible clanging sound like an orchestra of steel echoed throughout his home as a figure in armor unfolded itself from within the circle. A tall figure, dressed in what seemed to be ancient samurai armor of the east, with a body like red steel. It's empty eye sockets stared directly at Asher. "I ask of you, are you my summoner?" Damn damn damn damn damn. Fatina sprinted up the stairwell as fast as she could, trying to keep the worst case scenario out of her mind. She had started at the very bottom and slowly, painfully climbed her way up the ranks of life. Through her sweat and blood, she slowly carved out a life for herself even down here in the depths of Inferno. She was aware that this made her many enemies along the way, but she felt confident in herself and her ability to deal with them. But this was an attack from a direction she had never expected. An attack that struck close to her heart. And fighting back tears, praying she'll make it in time, she sprinted onwards. Elsewhere, a girl slowly began to wake. She had been drugged. Leila gradually began to become aware of her surroundings. She had been bound, head to toe in ropes preventing her from moving. Standing before her was a man, one of Fatina's rivals in the Night Parade to rising through the ranks. Just what was he doing? It looked like he was drawing something on the floor, but Leila was unable to make sense of what it was. A memory suddenly jolted through her mind. Wasn't she talking to this man last night? What had they been talking about? Something about a secret uncovered which could grant some sort of power...? She hadn't really understood it at the time because that was the exact moment her memories went out. But an idea was beginning to form in her mind, and it scared her. Her fears were soon realized as suddenly a giant cloud of red smoke erupted through the room, and in the center of the circle stood a female devil. The man kneeled before her. "Great Devil from the pits of Hell, I seek a wish that I request to be granted." Call it coincidence. Call it destiny. Ashley Harker was a man with a dream and a vision. Unfortunately for him, his desire was an impossible fantasy, and nobody understood this better than he did. Nonetheless, every day, every morning he would wake up and despite the sheer reality of life in Inferno, he would try to make the world a better place. Every morning. Every day. For weeks and months and years, he fought his thankless war on his own. He had his small victories, and he's seen his share of tragedies but even as the world beats him back, he continues on. This morning began just like any other. He had been walking down the streets when he witnessed an attempted kidnapping. A man grabbing a young boy, ripping him out of his mothers hands, sprinting down the street. Unfortunately for him, Ashley had been further down the street walking in the opposite direction and quickly moved to block his path. The kidnapper looked up, made a quick decision, and threw the kid hard one way as he quickly sprinted down the back alleys in another direction. Ashley managed to catch the child, preventing him from getting hurt but by the time he got back up the man had vanished. The criminal had gotten away, but at the very least he had managed to save one person. His mother broke down in tears as he brought her son back to her, and despite his protests that he didn't need any kind of reward, gave him an old, leather-bound book. She said it was a priceless family heirloom and the most valuable thing that they possessed. Not wanting to be rude, he graciously accepted the book. Flipping through it however, made it clear exactly how valuable the book was. An ancient grimoire, filled with all sorts of supernatural knowledge. Ashley quickly returned home and spent the rest of his day slowly and thoroughly reading the book. And as he read, an idea slowly began to form in his mind. It was well past midnight by the time he finished preparations. A large intricate summoning circle had been drawn in the center of his room. He closed his eyes and took a deep breath as he mentally prepared himself for what he was attempting to do. This was an action that could not be undone. A sin that would not be forgiven. But for the sake of his dream, for the sake of a better world... he was willing to break such a taboo ten times over. He opened his eyes and performed the ritual that had been detailed in the book. There was a blinding flash of light, and within the center of the circle stood a large bull headed man, calmly staring at Ashley, measuring him up with his eyes. Outside, dawn had finally arrived, as the sun slowly began to rise over the horizon. It was morning again, but not unlike any other he had ever had until now. "Tell me, what is thy desire?" Last edited by Tangerang; January 7th, 2019 at 10:20 PM. There was a man with the head of a bull in front of Harker, as he looks at the being before him with a soft smile on his face. He walks towards his door and opens it, looking at the sun as it begins its slow, everlasting journey through the sky. Around the hovel he calls 'home', he sees it - a destitute land is outside, the barren wastes of Inferno. "Tell me, what do you see when you dream?" He asks of the demon, his hands behind his back. "What is it that you see when you close your eyes?" Harker is not a weak person. You cannot be weak to live in Inferno, but at the same time, there is a difference between weakness of body and weakness of mind. He thinks back, to the people he has tried to save, the many, many lives he has tried to help, and the disgust and hatred that has met him, time and time again. There is no peace here. He knows this to be a truth, a concept that cannot be denied. The peace that exists in his dream is just that - a dream. Something that is so far out of reality that it is akin to fantasy; a story such as the one he sees when he closes his eyes is something out of a book. But books can do many things. Books brought this demon before him. "What is it, that you see when you dream?" He waits, thinking, in his cell. A day goes by. More tests. Night. Lights out. He sleeps. Morning. Lights on. More tests. Breakfast. More tests. No lunch - they need an empty stomach. More tests. Dinner. Night. Lights out. He sleeps. Morning. Lights on. More tests. Breakfast. More tests. Lunch. More tests. Dinner. Night. Lights out. He sleeps. His days continue, the pale lights marking the muted white of the walls around him in passing. The cycle repeats without end. They have him do a combat trial. A0-22 wins. He puts his sword to the other boy’s neck. Another trial, without weapons. A0-22 wins. He grabs the girl’s throat. Another trial. A gun is placed in the center of the room. Twelve participants. Twelve bullets. A0-22 gets there first. He pulls the trigger. A0-22 opens his eyes. The morning lights haven’t come on. He hears the sound of running. Faint screams. His bare feet pad along the floor of his cell. He pulls at his door. It opens. A hand curled, as if asking a question. Nothing else remains. He emerges into the corridor. The lights, his one constant, his sun and moon, are flickering. Somehow, he wanders. His feet pull him forwards. He does not flee. The world is perfectly silent as he opens the door. A black dog stands above a corpse. Its eyes burn red. A tear trails down A0-22's cheek. The words don't come, but their meaning is still conveyed. Last edited by Mooncake; January 8th, 2019 at 02:22 AM. I understand, more than any outsider ever could, what it would mean to be found by my pursuers- of all the things in this world that I could claim ignorance of, death at the hands of your comrades was not one of them. Of that, I was very familiar. If it was one on one, to fight back would be to leave one’s fate entirely to chance. If it was two on one, then combat would be foolish, but not impossible. If it was three on one, then the only outcome would be death. So instead, I chose to run. Running is something I’m good at, after all. I’ve been running my entire life, doing my best to avoid facing the implications of what I’ve been doing- anything and everything that would pose a problem to me, I’ve always put at the back of my head and tried my best to ignore. What I am doing right now, I understand, is a crime of the most heinous nature. To summon a devil- it is the ultimate taboo. A crime for which in the eyes of the public there can be no justifiable excuse. And for once in my life, I do not intend to make one. I know what I am doing is unacceptable and I accept my sin. As I stare at the foul mass of flesh that arises from the portal, I begin to feel pangs of doubt creep into my mind. It whispers to me that maybe it’s not too late to try and back out, that what I’m doing is irrational and that I would realize this if I merely thought things over again once more, to reconsider the contract that I intend to make. That what I intend to do right now is tantamount to denying the entire existence that I’ve lived up until now- ruining everything I've done to survive to this day. But I don’t listen to a word of it. These whispers are nothing more than the death throes of the person I once was, the last pleas of a person whose words are nothing but wasted breath. There is nothing I regret from leaving this life behind. Forcing out any last bit of hesitation, disgust, and anything else that could compel me away from the decision I am about to make, I approach the Devil and respond to his growling. The devil crossed his arms and snorted. "A foolish pointless question. Do you mistake me for one of your mortal brethren? I am not the dreamer-"
He raises a single finger and immediately the an inky blackness seems to flow outward from him, dying the entire room in darkness. Ashley soon found himself standing within a dark void containing only himself and the devil before him. "-I am one who collects dreams." Countless objects materialize out of thin air in the distance and slowly begin orbiting the two of them. These are... portraits, Ashley realized. Countless pictures of both men and women, numbering in the thousands or even tens of thousands. "I am the great and powerful devil, Alexander. I have seen countless dreams throughout my lifetime. Men and women with desires far greater than their meager frames can contain. Insane goals and mad ambitions, I have seen it all with my own eyes. Sometimes they succeed in their hunt of a miracle. Most of the times they fail. But their dreams were true dreams." "Asking for my dream is beyond foolishness." As he listened to the devil speak, a sudden realization hit Ashley. Throughout this entire time, this entire demonstration, not once had Alexander's judging gaze moved away from staring into Ashley's eyes. The wolf stares into A0-22's face intently. The laughter, the tears, the silent message the boy tried to convey. The meaning is understood. All of a sudden, the wolf vanishes from the boy's sight. Immediately, he feels a burning heat at his back, feels a cool steel by his throat. With an inhuman speed the devil wolf had moved behind the boy, and held its tail of blades near his neck. The wolf spoke in almost a whisper into the boy's ear. "I hold your life in my hands. What will you do now?" There was an almost curious tone to his voice, as if it was asking a simple question instead of a life or death situation. The mass of flesh and wounds paused as it digested this question. "Self-loathing... is a human emotion. Hatred of oneself... is it? I know of it... but have no use for it... So I suppose I do not fully understand it..."
The creature spoke in short growls, almost in a beastly fashion. It tried moving one of it's limbs towards Theola but upon making contact with the summoning circle there was a sizzling noise and the smell of burnt flesh. The beast withdrew its limb with a scowl and glared at the girl. "So is that... your desire? You seek self-loathing? You... wish to hate yourself?" In the next moment, the dog's tail kisses the back of his neck, each strand of hair - each piece of fur - resembling a blackened sword choked with blood and smoke. The same sword it had cut them down with, each and every one, except for him. The same sword AO-22 had struck them down with every day, as they told him to fight to the death. He turns to face the dog, slowly, the tail of blades not once leaving his neck. As he turns, he thinks back to the reflections of his cell, empty, cold, dark. He has had nothing to do but think himself to sleep, every night, for the first 11 years of his life. He knows. He looks at his hands, sees them slowly closing into fists. "...I won't do this again. I will rebel." His voice is quiet, but intense. There is a fire, a wish, that screams inside of his heart. "...Even if everyone is against me." Harker watches as the demon crosses its arms, a snort exiting its massive snout, the warmth of the breath rushing against him as he stares at the beast before him. It's tall, taller then anyone Harker had ever seen, and power radiates off it as it speaks its phrase. The dreams of countless people. The dreams of people who Harker has never met. It laughs, long and low. Harker smiles again, inclining his head. "Yes, I suppose that is true. But it is a human trait, is it not? To believe that everyone, and everything, no matter how big or small, has a dream. Even an ant dreams of things beyond its stature, would you not agree Alexander?" That everything 'dreams of something greater'. It's simply a falsehood. Some men do not dream - they are content with their lot in life. They sink into a veil as black as the darkness that surrounds Harker and the being before him, and awaken with a smile on their face and a spring in their step. This is what it means to be 'content'. Harker has never known such rest, as when he closes his eyes -- he can see it. In Harker’s dreams, the sky is free. In Harker’s dreams, a girl laughs. In Harker’s dreams, there’s a world where no one goes hungry. No one is sick. No one fights over scraps. Everyone is at peace. It’s a beautiful dream, really - something unattainable, something that nobody could possibly reach, and yet when Harker closes his eyes, it’s all he can see. Some people in this empty, broken land that they call ‘home’ - they dream of a warm bed. Of food. Of their family. Harker has never been one of those people, there’s too much bitterness, too much hatred in this world for him to ever have something so simple in his dreams. "Collecting dreams, you say? That is a dream in and of itself, is it not?" Harker asks of the demon. "The dreams of mad men and the vainglorious are not something that I wish to discuss, however. You see, Alexander, I have a dream." "I do not dream idly. I do not dream simply. Those are for lesser men." --they are all like Harker. "Are we not all equal under this same sky? If you cut a man in Paradisio, does he not bleed the same as a man in Inferno?" Harker's eyes harden as he speaks, his fists clenching against his own will. "This was supposed to be a paradise, was it not? An unparalleled virtuous place where everyone could be perfectly happy. And if not happy, content perhaps." The Tower is a paradise. "And yet, here we rot, while those above us slave for those yet above them. Would you call that just, Alexander? Righteous? What does it mean, to be lawful in a land of lawlessness? How can one be kind, to those who are assuredly unkind? This is the lot we were dealt, when we were born in Inferno." Some would call it unfair. Some would cry against the unjustness. Harker is not one of those people. He glances around, seeing the portraits that pass, the dreams behind the people inside of them, and glances at one. A man, whose gaze is like iron and heart is shut like a trap. A man, with a dream of bringing his family together again, even though they are long since dead. Harker nods. "A good dream. I do not dream of such things." "I," he says, his eyes filled with fire, "Dream of revolution.​"
Last edited by Frantic Author; January 8th, 2019 at 04:27 AM. Ana had no choice, slowly with agency was lost with each passing bad decision, she was a wreck andapped in this disgusting hovel with them. This was the only option available to her. It may have been the ultimate taboo but eternal damnation had lost the fear it once imposed. Ana was already living through her own personal hell. And so while the caged bird learned to sing for her captors, she remembered, she prepared. The ring was forged, the price was paid through her blood and now... there was was. The black smoke that billowed out in front of Ana was cut through by the sunlight and Ana saw her saviour. She was tall, strong, imposing, everything Ana wanted, everything Ana needed. The girl couldn't help but stare in awe, it was a figure that demanded attention and respect from Ana. And her eyes... they shone like the most gorgeous gems. The caged bird didn't sing, nor did she flap her wings wildly in excitement. She could only murmur two words at this sight. And the one who was summoned did not react. She wanted something more, as if she was not impressed with the ruin that laid before her. Understandably so, this was a devil from hell and here Ana was gazing up like a helpless love-struck maiden. Biting her lip, Ana did her best to rise to her feet and brushed the hair out of her own eyes to try in vain to make herself look presentable. The most difficult thing to do was try and smile. The blast just after the ritual was conducted was rather unexpected. Promising yes, but unexpected just the same. A noise filled the littered room, the clinging of steel together. Inspecting the source of the noise as soon as it entered his ears, he looked upon a strange visage. A figure, taller than anyone he ever knew, unfolding itself slowly and purposefully. Clad in armor only seen in the tales of old. And red, so very red, like it was clad in the blood of every enemy that dared once face this creature. Meeting what felt like its gaze, the two stared towards one another, until the samurai spoke. For but a mere fraction of a moment, Asher's expression turned to a savage grin, before returning to a more serious expression once more. "Indeed, I am the one that sought you out, and summoned you here"
Steeling his resolve, he continued facing the warrior far removed from the mundane. "I have but one thing left in this city, in this life even, one final bastion that will keep driving me forward. A dream, one I have clung to all my life. However reality won't allow that dream to become a reality, I've realized that now." The samurai stands there, towering, intimidating and unmoving. Listening, waiting. "But that won't stop me, I'll make that dream a reality, no matter what. I will go through hell and back if I can obtain it. I'm not looking for forgiveness, nor justice, mercy or any other quality like it. Those that exist here." His eyes shining like the stars themselves now, as he continues speaking to the hulking, red figure. "All that matters in this world is power, that is what I seek. And to that end, I shall gift all of me, to you." The boy turns to stare at the devil. Despite being inside the jaws of death, the fire of life burns brightly within his eyes now. "...I won't do this again. I will rebel...Even if everyone is against me." The devil could find no trace of falsehood within those eyes. There was something rare here, something to be considered, tested perhaps? It wouldn't do to dismiss this boy like the other corpses now scattered throughout the room. Fools who did not understand the gravity of the situation had no right to live within this world. "And against what is it are you rebelling again, mortal? That you are willing to make an enemy of so many..."
The wolf gave a sinister grin. "What will you do if that 'everyone' includes me?" "Yes, I suppose that is true. But it is a human trait, is it not? To believe that everyone, and everything, no matter how big or small, has a dream. Even an ant dreams of things beyond its stature, would you not agree Alexander?" Alexander remained silent, but gave a small nod in acknowledgement of that statement. Perhaps nobody understood that truth more completely than Alexander himself. To be human meant having a dream, a dream of greater things. A dream is what separates the men from the beasts, what drives humans forward to climb to greater and greater heights, to brave impossible odds. As far as Alexander was concerned, without a dream a man might as well be corpse. Such a life couldn't be called living. "Collecting dreams, you say? That is a dream in and of itself, is it not? The dreams of mad men and the vainglorious are not something that I wish to discuss, however. You see, Alexander, I have a dream. I do not dream idly. I do not dream simply. Those are for lesser men." "That is for me to decide, human. I shall hear and judge this dream of yours." "Are we not all equal under this same sky? If you cut a man in Paradisio, does he not bleed the same as a man in Inferno? This was supposed to be a paradise, was it not? An unparalleled virtuous place where everyone could be perfectly happy. And if not happy, content perhaps. And yet, here we rot, while those above us slave for those yet above them. Would you call that just, Alexander? Righteous? What does it mean, to be lawful in a land of lawlessness? How can one be kind, to those who are assuredly unkind? This is the lot we were dealt, when we were born in Inferno. A good dream. I do not dream of such things. I dream of revolution.​"
The devil did not speak. He listened to the man's dream in silence. The reasons were unimportant. The only thing that mattered was the desire. The will to act. Alexander could see such a will within the man's eyes. The strength to follow his path through to the end, regardless of whether the destination is victory or suicide. He looked deeper, into the man's life and understood. A singular man fighting a lonesome war on his own. In that sense, perhaps even Alexander himself was insignificant in his eyes. Regardless of the outcome of this ritual, this man would continue fighting for his dream until his body and mind was crushed. The dreams of madmen was not something he was here to discuss? Yet there was a madness buried deep within this man, so deep that even he was unaware of it. Interesting. There is potential here. "Tell me more about your dream of revolution." The girl whispered in awe before the devil standing before her. As for the devil herself, she showed no reaction to the meaningless praise. For a devil, shape and form are inconsequential things. She looked at the girl laying on the floor before her and narrowed her eyes. An unimpressive girl in an empty lifeless room. It was clear she did not have much expectations at the moment. Still, there is such a thing as proper procedure, and rules to be followed. "That would depend on the nature of the assistance that you seek... but yes. I suppose I do possess the ability to help you, regardless of what it is you seek." "With that said, what exactly is it that you seek, and why should I assist you?" "Indeed, I am the one that sought you out, and summoned you here. I have but one thing left in this city, in this life even, one final bastion that will keep driving me forward. A dream, one I have clung to all my life. However reality won't allow that dream to become a reality, I've realized that now All that matters in this world is power, that is what I seek. And to that end, I shall gift all of me, to you." Was he simply a fool? Was he someone desperate? Was he someone with some impossible ambition? Or perhaps... was he simply someone with nothing left to lose? "Before that..." the devil spoke with a voice like clashing steel. "What is it that you seek power for? What is this dream you possess." "What will you use this power for?" Harker smiles, looking at the demon once more as he speaks, "A world, Alexander, where nobody is hungry. Where a girl can play in the streets without fear of someone kidnapping her. Where a man can start a business down here that is more then simply drugrunning, or smuggling - wouldn't that be a wonderful world?" ...a dream, and nothing more. "I know it's impossible. I know it's absolutely impossible to bring the beauty of Paradisio to this place, but --!!" Does impossible mean 'it can't be done'? Impossible is a phrase Harker knows all too well; it is 'impossible' to change this slum, by saving one person. He's been told so time and time again.
" --Does that mean we cannot try? No. To try is to be carved down by those above us, Alexander. Those who think themselves our betters, even as their betters look down on them. We all look at the same sky, breathe the same air, live in the same place. Are we not the same?" He smiles, a soft, quiet thing. "To those above us, I would ask that they join us. To those below us, I would ask that they forgive us. To those so far above us that to even grasp at them is like a wolf grasps at the moon --"
"To them, I will destroy. I will tear the Tower of Heaven apart, brick by brick, until all that remains is the broken fragments of what was once society's own pillar. Listen to me Alexander, oh demon of dreams; I, Ashley Harker, will change this city. I will take the meek and raise them up, I will take the arrogant and bring them low. Inferno? Purgatorio? Paradisio? To me, they are all one level. Eden." "Eden is old, worn, and deprecated. It is corrupt to the very core, and every person who stands above Inferno is at fault." It's a whisper, that runs through the back alleys and in the corridors. "These people are broken, shattered, and damned. From Inferno to Paradisio, every single one of them has the thought 'well, it can't be helped." "This city is dying, Alexander." It's a quiet murmur in the back of an old lion's throat. "And I will definitely save this city." "And to that end, I shall gift all of me, to you." The warrior in red spoke once more, the sound of steel on steel, metal against metal filling the silence. "What is it that you seek power for? What is this dream you possess?" Asher relaxed a bit, it seemed like the ancient figure before him was not unsatisfied by his summoner. Yet it hadn't accepted a pact yet, it wanted insight. "What my dream is? ", Asher said bemusedly. "From as far back as i remember, my parents taught me that those that do good deeds get rewarded. That this place of Eden is as good, or bad, as we make it for ourselves. That if we help one another, treat each other right, that the lower circles can be just as peaceful as the upper ones. And that those that did all they could to truly do good, would be blessed and welcomed into Paradiso. And so, I did all I could. We shared food, gave shelter, we helped out those with losses, making the lives of the people here more tolerable." Asher gave a deep sigh, recollecting whats in the past would bring only discomfort and pain. "Of course, turns out there was no truth in their teachings, just the sprinkling of hope. I believed them of course, they were my parents, my role models. But they were taken from me, never to be seen again, like so many that night. But I wouldn't stop, I cultivated what little good the people in this hell hole have in their hearts. I did my very best to show that even in this hell, true good not only can, but does exist. And after all I did, I'm left with nothing." Asher removed a tear forming in his eye, he knew life wasn't fair. It seems so stupid in hindsight, to believe in good when evil is all around. He continued, he'd gotten this far after all. "What I dream of is simple. I dream of a life of peace. To live freely and in peace in the upper levels of Paradiso." He stood proudly before the supernatural. Determined and ready. Nothing would stop him trying to make that dream a reality, no matter what would happen. "I was born here, and just like that, my dream was doomed from the very start. There never was any way those blessed above would allow the people struggling below to know peace and bliss." He advanced towards the armored samurai, unfettered, until he stood face to face with the hulking red figure, peering into the ever so empty eye sockets. He clenched his fists, and continued as he waved his hand. "The hell to that. I will make my dream come true. I will take my place in paradise, even if I have to carve it out myself. Nothing will stop me, if reality stands in my way I will trample it. I will show everyone in this city that my dream is absolute, that it won't be shattered as long as I live. The city of Eden, the City of Glass itself, would shatter long before my dream could even start to crack." His starry eyed look returned, matching the fierceness of the armor worn by the devil before him. "That, Devil, is what I will use your power for." No more looking back, only charging forward now. This is where it all begins, Asher thought to himself. This is just the first obstacle of many to overtake. He lost everything by doing good, but that road has ended. A new path was before him, and he could continue dreaming of peace a little longer. "Now tell me, can you grant me that kind of power?" An unexpected emotion wells up inside me upon hearing the Devil’s response to my query. It bubbles up, attempts to burst through my attempts to hold it back, and I only barely resist the urge to break out into hollow laughter- a sight that would be most unfitting for this scene. Of all things I expected to feel in this meeting, amusement was certainly not one of them. That said, what amuses me right now is not some misunderstanding about the human spirit. If anything, it is the seemingly unintentional way in which he has laid forth to me how pathetic I am. Talking about this almost makes me feel like I have come to an understanding with this creature- an impression that is almost surely mistaken, I think, but that does not stop me from approaching closer. I stop on the edge of the circle, staring directly at the mass of flesh that sits within- at the entity to whom I am willing to sell the rest of this failed life of mine. Existence was a state of constantly allocated suffering. She had come to that conclusion long ago. Knowing this, she decided to separate herself from the pain of living. To escape the perverse balance of suffering that could only be passed to another. To become a ghost that neither hand nor thought could reach beyond the veil of the world. If she could exist in solitude, then surely that would be the closest thing to happiness. However, life was a curse that inflicted itself without distinction—even on the unwilling. A blade of grass on the wayside. Moss clinging to the underside of a stone. Hoping for nothing, availing to nothing, cared for by no one and unnoticed by all. But even they knew the loneliness of their existence. To transcend the truth of suffering, you must first taste the pain of living. Remembering the melancholy of human existence, even ghosts stray from the path of righteousness. And she knew this loneliness. When she buried her heart in its depths, she also came to know that pain. To suffer also for another, to feel their pain as one’s own, would be unbearable. Fearing this, she withdrew from the world, hoping it would pass her by in turn. She had thought she could await her end like that. As though she could turn away from life that easily. She thought, if only she had never been born—but she never had a choice. She thought, if only she could bury her heart—and here she did have a choice. She thought—but how could someone who had only seen the horrors of the world choose to renounce its beauty? She never spared a thought to love. She didn’t expect to live long enough to know what it was. She couldn't have known the salvation of a life lived for another. She wouldn't have loved if she knew that true suffering was that of the one you love. No—she would have. Only then could she know the ultimate truth. Love had no need to build a Hell in Heaven. The first thought that came unbidden was of a sensation akin to being born. It rose from the murky depths of her mind with a vague certainty, an emanation floating from the subconscious to fill the void left by rational thought. Gone before she could acknowledge anything more than its afterimage and the ghost of its touch on her consciousness. An impossible association with an emotion she could not possibly recall—but not an unreasonable one. Leaving the safety of the womb was perhaps the first traumatic moment anyone experienced. Perhaps even the greatest. Being alive, walking this earth, was there another curse such as that? Torn from the comfort of numbness, she realised she was completely bound. She could not move her limbs, could not so much as wriggle her body—a perfect helplessness. A newborn baby had more control over itself. Then again, a newborn had no true understanding of the world it was entering. Stirring from a forceful slumber, she understood her circumstances perfectly. And with that understanding came fear. She was betrayed. That she could accept without resentment. After all, when she had approached the man said to be versed with the forbidden art, she had done so with every intention to stab him in the back and erase the evidence of the crime. Not the murder. The demon summoning. Nevertheless, she shouldn't have harboured that intent without expecting the same in return. It wasn't trust—that was weeded out among the members of Night Parade in a natural process of elimination. No, it was nothing but carelessness and its natural outcome. A carelessness she had become increasingly familiar with over time, and one she would pay for. In that moment, she would have paid for it a thousand times over if it meant she could take on all of the consequences. Unfortunately, reality could never be accused of kindness. The more she shook off lethargy the more horror dawned on her. A terrible presence turning its gaze to the room. A terrible future coalescing into certainty. She wanted to scream, to rage, to cry, to no avail. The emotions could stir no more than her bound limbs, frozen in a mire of despair that permeated her being. A soul-rending pain from herself for another. What a fool she was. She had known from the beginning, but only in this moment did she understand. To live is to suffer. A life shared is a suffering magnified. Sinners burning in the fires of Inferno, clinging to each other for comfort only to share each other's pain, learning a new torment in the other's suffering. That was what they were. And she, the fool that tried to run from the world, had blindly reached out for a string to pull themselves out of Hell and would instead send them hurtling to an even deeper torment. Not in the name of love, but in fear of the suffering only love can create. Once, she had resented those feelings. The princess in the castle hated the one that had pierced through its walls and taught her the nature of her own loneliness. She had despised the light in the dark, the flower in the desert, the singular proof that beauty and happiness and goodness existed in the world that she had rejected. Knowing this, she thought, she could never go back to existing outside of the world, letting its horrors flow right through her. Such forbidden knowledge had cast her down from her unassailable tower, dragged her forcibly into a state from which there was no return—ruined her. Now, she only hated herself. She resented the cowardice that had driven her for all her life, the fear she had hidden behind and the selfishness she called happiness. And most of all, she despised the realisation that she was unworthy of that love. And did she appreciate the gift she had been given? Did she ever repay that person for it? If only I had never been born, she had thought. How would that person feel when she was dead? She didn't have to imagine. She knew. She would feel exactly the same. She understood with perfect, terrifying clarity the pain that she would force on them. Existence was a state of constantly allocated suffering. The ones closest to you are the greatest victims. Fearing for the life of the person she loved, she had sought for a way to save them. In doing so, she had condemned them. Such bitter irony. She had been prepared to sell her soul to the Devil to save the one she loved. Yet she should have been the first to understand that a life devoid of what gave it joy wasn't fit to be called living. All the more that her soul would become currency for another's benefit anyway. The man's words did not truly register to her. From where she was lying on the dark room's floor she could only make out his hunched form, kneeling in the pool of smoke rolling out to all directions, but no other details could have drawn her attention any more. That was because they were not alone in the room. And the other presence was one that commanded full notice. A beat of great black wings dispersed the crimson fog in a circle underneath it. Descending from some distant unknown in the middle of the sunmoning circle was a mockery of an angel. Thick horns curved to frame a fair face, the visage of a young child exuding an air of confidence and untold mischief. Belying the demonic nature manifested sparingly, a doll's body, pale and thin-limbed, was clad in an equally lovely dress. Without a shadow of a doubt, the one that infused an imperious tone to a young girl's voice to address the room was a genuine Devil. Name thy deep desire to Gremory!" The Devil's peals of laughter, a gleeful cackling horribly at odds with the innocent voice of its guise, echoed at length in the small room. Neither captive nor captor could find it in them to interrupt it. In fear or astonishment, it could hardly be said. An oppressive air had settled the moment the Devil's feet touched on the floor, clogging up their throat like a viscous membrane reminiscent of heavily moist air and thick, cloying honey. To speak up required conscious effort. To speak out of turn to a Devil necessitated suicidal tendencies. Though on her part, she was gagged to begin with. Nothing filled the silence when the Devil's laughter subsided, and it could only be assumed from the turning of its mirthful lips to a pout, in another echo of its human semblance, that this displeased it. Slender fingers drummed together in irritation. She even thought its foot slightly stomped, but that may have been a reverberation from somewhere in the building. The man had said that demons took forms as varied as they were grotesque. If that was the case, then assuming the likeness of a young girl down to the mannerisms surely was among the worst perversions. The clear voice rang out again. "Struck dumb, art thou? We commanded thee to speak." She could not see the man's face, but it appeared that being addressed directly by the Devil had shaken him from his stupor, or at least triggered his preservation instinct, as he stammered out a string of apologies that only furrowed the Devil's brow further. Realising this, his grovelling soon stopped. Even the small satisfaction she might have gotten from that man dying along with her would be denied, it seemed. 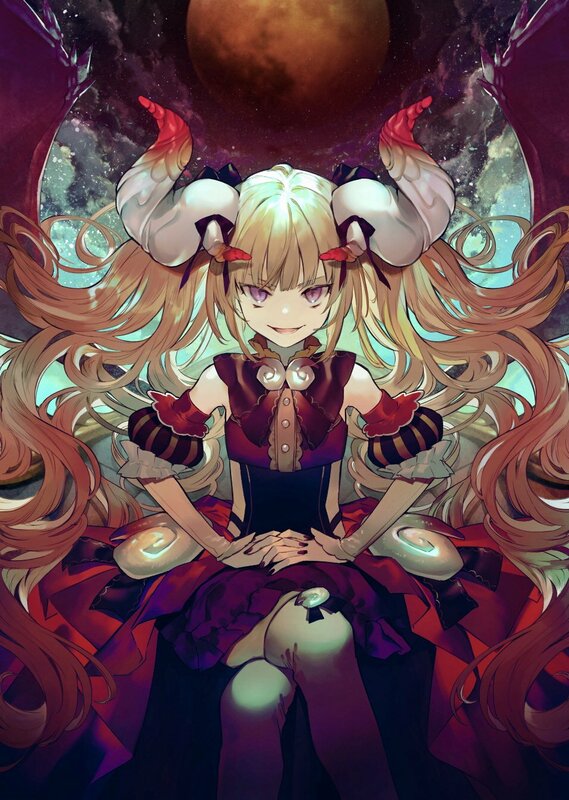 "G-Great Duke of Hell, accept this woman's life and soul as sacrifice, and grant me the power to rule Inferno!" No, she would die alone. "Knowest thou whom thou hast summoned?" And her death would destroy all she had ever loved. "We are Gremory, Duke of Hell and Devil of Love. Hast thou need of Our domain, else art thou wasting Our time?" Having lived for no one, she couldn't even die for another. Forgive me, Fatima. And I beg you, live. Last edited by Leftovers; January 12th, 2019 at 11:26 AM. Hard eyes. The hardest eyes that you could ever see, in the face of someone who had forgotten how to smile years ago. No - maybe from the moment he was born. His fists harden, too, until all that's left is a statue of a boy, a faint shadow of the man he will become. It's the most he's ever spoken in a long time. A fire burns in his heart. He remembers his cell. Every day, every night, a room without windows or life. A room without any dreams, except his secret. His one desire that moved his body when it was tired, when it was weak, when he was placed into another trial and told to fight until he could fight no more. He remembers the feeling of breaking, crying, using his teeth when no other weapon remained. All of this, all of this punishment and pain - and still he had stood. He had gotten back up, now and forevermore. Killing a devil itself was the height of foolishness, surely. No human could stand against that which lived on the outside. That lone flame in the chambers of his heart lit the boy's eyes until it became impossible to doubt. "I won't stop until I tear it apart." The mortal smiles fearlessly as he returns the devil's stare. "A world, Alexander, where nobody is hungry. Where a girl can play in the streets without fear of someone kidnapping her. Where a man can start a business down here that is more then simply drugrunning, or smuggling - wouldn't that be a wonderful world?" Harker continued, his words, his eyes building in intensity. Despite the fact that his dream was impossible. Even though his dream was impossible. He knew this. He understood this. Still he dreamed it. A dream too large for a mere human to even hope to accomplish. "Eden is old, worn, and deprecated. It is corrupt to the very core, and every person who stands above Inferno is at fault. These people are broken, shattered, and damned. From Inferno to Paradisio, every single one of them has the thought 'well, it can't be helped. '...This city is dying, Alexander. And I will definitely save this city." ...he summon a being that is beyond human understanding. For the sake of his wish he dives headfirst into powers beyond his control. The world he lived in. The world he envisioned. The two were fundamentally incompatible. But he refused to compromise. His dream was not incorrect. It was the world that was wrong. And so it fell to him to change the world. Isn't that the purpose of a Devil's contract? Alexander could see the strength of his will within Harker's eyes. As Harker had spoke of his dream, Alexander measured the power of his conviction within his heart. No matter how different the dreams may be, this is the singular measure by which all dreamers can be measured. Alexander extended his hand. Inside that hand, was a spark of light. However, that hand remained within the boundaries of the summoning circle. To enter it's territory... would be to give up all protections, to put himself at the mercy of the devil. "Here exists either the power you seek or your own self-destruction. The choice is yours." Alexander spoke without judging or condemning. There would be no shame in retreating to safety. No sin in refusal. To gamble one's life for power is pure madness. After all, inside the circle stood a devil from the pits of hell. And yet, to think that one could obtain the power to shake Eden without even risking one's life was just as insane. The choice lay with Harker. "That, Devil, is what I will use your power for. Now tell me, can you grant me that kind of power?" The devil gave a short laugh. It seemed to have been truly amused at something, as if it had heard some fantastic joke. "Of course I can grant you power. Great power just as you desire. But are you aware of what you're asking?" "You dream of a peaceful life. And you seek to obtain it with violence. Furthermore, to obtain that peaceful life, you will shatter numerous other peaceful lives with your own hand, plunge them to hell by your own will." The selfishness of humanity. The greed. The violence. A never ending cycle of strife and conflict that grows with each repetition. What a beautiful thing. It was the greatest entertainment in all the universe. It was something this devil could watch for over a thousand years without tiring of it. And the best part of it all is that humans did this all of this own will. With full understanding of their actions, without any room for excuses. "You understand all that, don't you~?" With those words, the room became silent. Nothing could be heard except for the shifting of flesh, as the creature digested what had just been confessed to it. One who cannot stand oneself. One who cannot accept oneself. One who cannot no longer live with oneself. For someone who is no longer willing to walk down their own paths, their only recourse is to jump off. To fall into the abyss. But... that is not something that would normally require the power of a devil. "...you understand what you are requesting?" If only people could change just by wishing to change. But it is precisely because most people can't change just by desiring it. "...what you seek is no different from... suicide... The death of yourself..."
"Knowest thou whom thou hast summoned? We are Gremory, Duke of Hell and Devil of Love. Hast thou need of Our domain, else art thou wasting Our time?" The man is taken aback by the forcefulness of Gremory's personality. Stuttering, he tries to regain control of the situtation and answer properly to the devil's request. "Oh g-great demon, I have s-summoned you because I have a w-wish that I request y-you grant. For I seek a great power!. One strong enough to overcome my foes, and succeed in gaining the love of the one I have fallen for." "You won't stop me. No one will. I won't stop until I tear it apart." Several heartbeats pass. All of a sudden, the boy could feel the pressure suddenly lift from his body as the wolf removes its tail from his throat. "Not a bad look in your eyes. Not bad at all." Ah, that's what it was, the devil realized. There was a animal hunger burning quietly inside this child. A bestial fury that gives him the strength to bare his fangs at an existence llike a devil. Does that make him more than human, or less? What a fascinating specimen. There is value and worth here. "Remember this heat, this feeling burning inside you." The wolf moved around the boy, until they were standing face to face. The wolf's eyes glowed like burning forests, and it's breath was like an inferno. But the boy did not back away. "Tell me, my powerless little rebel. What is your name? And what is it you desire?" ...A light. A small chance at salvation. A chance to grasp at that beautiful, wonderful dream that Harker's held in his chest for so long. But to do so is to risk everything. It is to enter the summoning circle that holds the demon at bay, to risk his very soul at a chance. --But even a chance is something Harker cannot deny. "Hah..." It's a sigh that leaves his lips, as he looks the demon in its eyes. "Isn't power in and of itself self-destructive?" No faltering. No hesitation. That's the kind of person Ashley Harker is, with eyes that burn like fire and a soul made of steel. It's dangerous, to stand this close to such power, such overwhelming presence but Harker wouldn't have it any other way. There's a whisper, amongst the people of Inferno. A whisper, of a man who will save anyone, who will protect anyone, who will stop injustice wherever he sees it. Most laugh it off as a joke. They say that such a man is too impossible to exist. You cannot change Inferno by saving one person at a time. It's impossible, a totally unfeasible dream. But Harker is used to these sort of dreams, the sort of dreams that everyone says are impossible, the sort of dreams that even madmen look at and consider it ridiculous. Ashley Harker is a person with a dream. And that dream won't be stopped by anything short of death. He will definitely save this city. It's a statement that's absolutely impossible, totally untenable, and utterly absurd. And yet -- when he says it, without any hesitation, with such assured belief... It's almost believable. It's more then believable, it's possible. "If no one can believe, how can anyone ever have faith?" "If no one shows what is injust, how can anyone know what justice is?" "If a king does not lead--"
--And the hand of a man meets the hand of a demon.
" --How can he expect his subordinates to follow?" Last edited by Frantic Author; January 11th, 2019 at 05:38 AM. "Oh g-great demon, I have s-summoned you because I have a w-wish that I request y-you grant. For I seek a great power! One strong enough to overcome my foes, and succeed in gaining the love of the one I have fallen for." A bold proclamation, if the stuttering could be excused. Bold, yet vague. It was said that Devils were attracted to wishes that exacted heavy prices while being easily perverted. Therefore, it was of paramount importance for those who dared to dabble in the profane in order to pursue their ambitions to consider their wish carefully, weighing each and every word as though it were a binding contract with a swindler—and what else could a deal with the Devil be called? As the individual characteristics of documented Devils were hardly widespread knowledge, their summoning being the gravest taboo in Eden, that line of thinking served as a general rule of caution for the aspiring Contractors. Acquiring power to win one's love. She did not know the man, could hardly guess his thoughts or imagine the life he had led, but such a wish only seemed absurd. Power could protect, and it could also conquer. Perhaps her own wish might have been granted in such a manner—the strength with which to protect Fatima from anything that sought to do her harm. She was no stranger to violence and death, neither possessed of some childish notion that protecting a life precious to oneself by taking that of a stranger was reprehensible. People died for less every day in Inferno. Most of them for no cause or reason. The cold calculus of survival was a harsh lesson ingrained in every denizen of that living hell. She knew that she would do anything to protect her love. To preserve and shield it from harm, she could wield such power to drench herself with blood, allowing not a single drop to stain it. Even if that was only an illusion, the emotion would undeniably be genuine. But conquest was a love in itself, for itself. Power in the service of ambition, taking what was not freely given. What was won in this manner had, by necessity, resisted it. What then would a love taken by force be if not a sham cobbled together from what was trampled upon and broken? A twisted, self-serving thing. One could say it would appeal to a Devil, but she did not think that was the case. If her thoughts mattered in any way at that moment, if she could tear off her gag and scream those words at the Devil, she would say that the man was lying through his teeth, twisting his wish to appeal to the preferences of a demon he didn't expect to summon. Devil of Love, Gremory. Lying to a Devil only compounding their unpredictability. Its reaction would determine not only the fate of the summoner, but also that of the woman that could only hold her breath within her bindings. The monster in the guise of a young girl—frowned. "Human—nay, rather We call thee a dog. Thou'st insolence aplenty to call Us by that moniker." Taking exception for entirely unexpected reasons, the young Devil balled its hands to tiny fists and stared down the petrified man in what would have been an adorable tantrum from a regular human girl—now a bizarre, discordant experience. "Demons are to Devils as dogs are to humans. Or humans to Devils, for that matter! We'd fain have thy tongue for this!" Now the stomping was unmistakeable. Its leathery wings beat a few times in annoyance to complement it. The grotesque limbs were a reminder that its threat, delivered with an agitated, high-pitched voice, was very much genuine. It was a thing to wonder whether those mannerisms were a conscious act or simply an expression of the Devil's nature. It was hard to say which would be worse. Finally, the Devil Gremory relented its glare with an exaggerated sigh. "Hmph, but this should be expected from thou curs, no? Rip a tongue for every imbecile and We would never get a deal done." As though it was making a great personal sacrifice, the Devil folded its black wings to its back. Now much less imposing, the true size of its body was made all the more apparent. With it, the weight of its presence was reduced, the air itself seeming to lighten. In every likeness a blonde-haired young girl, only the horns remained to tell a different story. "Fine, then. We shall overlook thy transgression this once. Now, power, was it? It can be done, naturally, but not at a price to thy convenience." And for the first time, the Devil's eyes fell on her. "Tell Us, what is this female to thee? Wherefore should We deem her sacrifice sufficient?" of fire and brimstone had given her something she hadn't had in a long time. Hope. Ana trembled at the words. She knew what she wanted. She had tried and failed before, to be free of the hole, to be rid of them, to breathe fresh air, to be rid of them. That last part resonated however. Her heart yearned for freedom but it had suffered, it had been pained and right now it needed others to suffer for after all, misery loves company. Ana was close to giving up on it all, the dream of freedom and revenge was so fleeting. The past few weeks... or months, not that Ana could tell any more, had made everything simpler. Everything was so much simpler. As a child she wanted so many things but freedom in the upper city of Eden was paramount. Things were so much chaotic then. Inferno had made things clearer. Kill or be killed, trust no one - love is a weakness. "The people who did this to me, they have to die. Slowly and painfully." Ana's smile grew as the aroma of the devil filled her nostrils and the flames of her heart were stoked after so much neglect. Garrote them with their own entrails. Ana matched the devil she had summoned now, her mind full of her true desire as she spoke with and she could only count on her own means of doing so "And I have to be the one to do it." Love and vengeance are hand-in-hand the purest motivations, it was what made humans so simple. Ana was certainly no exception. The flame in her grew further still. "Grant me the power for this and I'll give you my soul." The devil was right, of course. Just the irony alone must have been delightful to such a being. This devil understood humans, it knew their true nature. It must've made various pacts with other humans before, enjoying their pitiful struggles as if it was the finest of entertainment. It knows the ugliness of mankind, it knows how pathetic we are, how we hurt, steal and kill for our own good. It's simply how humans have always been. This world is build on but a simple rule, kill or be killed. The predator and the prey, the hunter and the hunted, good and evil, the one who wins, and the one who loses all. After all, one man's loss may well be another man's gain. Nature has embedded violence into our very genes. It's a characteristic we can never hope to shed. Throughout human history we have honed our violence through war and battle. We are born kicking and screaming, violent towards the world around us. To be human, is to be violent. Humanity is cursed, rotten to the core, there can be no utopia for us as we are. I helped people, I cared for people, I aided, sheltered, fed and comforted those in need. I did all I could, helping, maybe even saving one person at a time. And I ended with nothing. That path doesn't have an ending worth the sacrifices. My dream of peace, it's not found at the end of that road. Perhaps there never was a way for me to attain my dream. And yet it is that dream that drives me forward now, it's all I have left, the fire that'll burn in my heart as long as I continue to breathe. ...then I shall become a devil in heaven. Asher started grinning, returning his thoughts to the devil before him spoke in such delight. "Yes, I understand fully what I'm asking. For the sake of my dream, I shall break, tear, trample, destroy, crush and kill anything that dares stand in my way." No amount of restraint could suppress the savage grin on Asher's face now. He saw a light at the end of the tunnel, a tunnel previously filled with only ever growing darkness. He might be playing straight into the hands the devil, however, so too did the devil play into Asher's hands. "Violence shall be my greatest weapon, with it I shall clash with the dreams and ideals of others and with it I shall walk over their shattered remnants." Perhaps it is true what they say. ...you must prepare for war. "I shall be the most human, the most selfish in all of Eden, and I will emerge victorious." Last edited by Zurvan; January 11th, 2019 at 07:58 PM.